Article 01 - Julie McClure Inc. Personal property appraisers have a place in nearly everyone's life. If you own stuff, you need to know what it is and what it's worth. Your insurance adjuster will want this information if your possessions are stolen, burned or blown away in a hurricane. Your lawyer - and your spouse's lawyer - will want the information if you divorce and are dividing property. If you are the guardian of an estate, the law requires an appraisal of personal property to protect the heirs. Even if you are having a yard sale of years' worth of accumulated stuff, you would be wise to hire an appraiser to do a "walk through" - giving a verbal appraisal before pricing items, just to make sure there are no treasures among your low-priced trinkets. 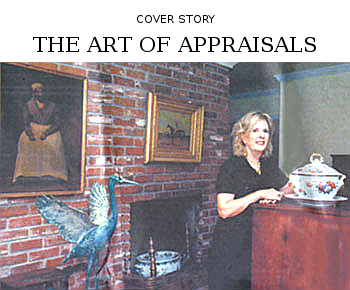 "I had a client selling everything her mother had owned, so she could afford to paint and carpet her house," said Julie McClure, owner of Appraisals and Sales by Julie McClure Inc. "Everything she had was in the $12 to $30 range, except a tall case clock by the best American clock maker." The owner thought the clock might be worth $2,000 or $3,000. McClure sold it for her for $22,000. "She just had no idea," McClure said. "And she didn't have to sell any of her mother's things after all. I have pulled unbelievable things out of the 'charitable contribution' piles before estate sales." If you watch the popular TV program "Antiques Roadshow," you know appraisals come in two types - fair market value and replacement value for insurance purposes. Fair market value is usually lower than replacement value. Different appraisals have different uses. Replacement value is the amount to insure your item. The insurance settlement would cover the cost of replacing it if your policy specifies "replacement value." Fair market value reflects what the item is actually worth in the marketplace. Divorce laws in Florida require fair market value be used when dividing property, McClure said. Fair market value would also apply to estate appraisals. A recent Internet search for a Royal Doulton cup and saucer in the Fireglow pattern revealed a vast difference between replacement cost and fair market value. Replacements Ltd. in Greensboro, N.C., lists the cup and saucer in stock for $18.99 plus $7.99 for shipping. But an identical cup and saucer in "mint condition" can be had from an eBay seller at his "buy-it-now" price of $5.99 plus $1.50 for shipping. McClure said divorces are "the worst" when it comes to appraisal jobs. "Everyone hates you when it is over," she said. "The husband thinks your fair market value is too low, the wife thinks its too high. But, fair market value is how property is valued in a divorce." Professional appraisers are needed in some cases, but not always. "People need to look at their insurance policies," said Ina Baden of Palma Sola Sales and Appraisals. "People think they are covered for everything because they have $50,000 worth of coverage, but coverage per item is limited to a certain amount - usually $1,000 - unless you have an appraisal that is added on as an addendum to your policy." Most insurance companies want a regular appraiser who will give a description of a scheduled item, she said. The written appraisal not only values the item for claim purposes, but also verifies that the policyholder had the item in his possession, said Kathy Wentzel, a licensed insurance agent with Wyman, Green and Blalock Inc. Some appraisals do not need to be in writing, and are therefore less expensive. Baden charges between $50 to $75 per hour for verbal appraisals and will even write prices on sticky notes for your vintage yard sale items. "Sometimes people just want to know what something is worth before they go through the trouble of trying to sell it," she said. McClure's fee is $75 per hour for a verbal appraisal, but she said she charges less when it is clear that the total value of items in a sale is considerably low. Written appraisals cost more. Baden's fee is $75 to $100 per hour, and McClure charges $150 per hour for the first hour and $100 for each subsequent hour for insurance purposes. McClure's fee is $150 per hour for every hour she spends on fair market value appraisals for divorces. Neither appraiser bases her fee on the value of the item. McClure is former senior appraiser with the American Society of Appraisers, and Baden is a member of the International Society of Appraisers. Unless your household property includes antiques, guns, coins, fine jewelry and silver, you might not need a professional written appraisal. But everyone needs an inventory, McClure said. "An inventory is very important," Wentzel said. "It does help settle the claim much faster. We usually tell people to use a video camera and video each room, including the closets. It gives the adjuster an idea of what you really did have." You can be your own appraiser, McClure said. By using Internet shopping and auction sites, you can determine replacement cost and fair market value for many items. By doing some of the work yourself, you can save on the appraiser's hourly fee while still having your antiques or unusual items appraised for insurance. Reappraisals are sometimes helpful for items that have increased or decreased in value. Baden recently sold a 1950s kitchen table and chairs to a dealer who she thinks probably marked it up two or three times. "It had a red tile top with aluminum," she said. "A dealer bought it for $395. It was in nice condition, but those are the kinds of things that are really hot right now." What are not hot are Hummel plates and figurines, collectibles that sometimes sold for more than $1,000 in the 1980s, but have fallen more than 50 percent in value, McClure said. "Fifteen years ago, a 1971 Hummel plate in its box sold for $1,200," McClure said. "About eight years ago, it sold for $600." It's about supply and demand, she said. "What tends to happen is that when there are high prices like that, a lot of them appear," she said. "There was the Baltimore quilt that sold for $100,000, but once the news hit, lots of Baltimore quilts were suddenly available." Some classic antiques - quality items made more than 100 years ago - retain their value, but do not necessarily increase. McClure owns several pieces of ceramic ware from the early 19th century that are still worth what they were 20 years ago. Two blue-and-white jugs, valued at about $350 each, with matching mugs worth about $150 each, fit nicely among the books and what-nots on the bookshelves in McClure's northwest Bradenton home. While their monetary value is substantial, McClure's enjoyment of them seems to be more for their intrinsic beauty, craftsmanship and history, and that she inherited them from her mother. "They all have the same design with foxes and horses, which were taken from a print," she said. "They were all made in different factories, in the Staffordshire (England) area, maybe the Turner Co., and perhaps even by different designers. But they are identical in their theme." The pieces were manufactured from about 1800 to 1830, and first owned by prosperous middle-class families, she said. 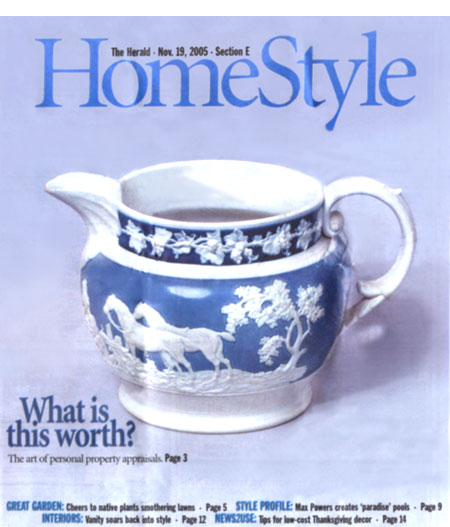 The Wedgewood style was so popular, there were literally more than 100 imitators who made objects in the same style, in the same blue and white, she said. Because they belonged to her mother, the pieces have more value to McClure than they might on the antiques market. But that value cannot be reflected in an appraisal for insurance purposes. "Sentimental value is not transferable to monetary value," she said. "Unless your relative was famous. Martha Washington's relatives still sell off their things from time to time." What was your best find at a garage sale? What did you pay for it? What is it worth? Discuss your unique finds in the Discussion Boards at HeraldToday.com. Appraisers should never, ever purchase items they have appraised. That is a clear conflict of interest that an ethical appraiser would not breach. Make sure your homeowners insurance states your items are insured for replacement value. If you have to go out of town to oversee the disposition of a relative's estate, have the estate appraised by a reputable appraiser in that town. Get referrals from a local bank's trust department or use the referral services from the national appraisal organizations. Do some of the work yourself, using on-line resources to document replacement values for easy-to-replace items. SOURCE: Julie McClure, Sales & Appraisals by Julie McClure Inc.
ebay.com, resource for fair market value. Replacements.com, resource for replacement value.